China completed a trial of those accused in the milk-poisoned children scandal today, handing down death sentences and sentences to life in prison. But the government itself took no responsibility for decades of improper food regulations, monitoring and government employees looking the other way when wrongdoing was obvious. I pesonally saw improper use of chemicals like animal feed, melamine and fertilizer added to food products in China starting in the 1970s — so this issue is not new. The New York Times investigated this issue in 2007 and found the use of melamine “an open secret” amoung tens of thousands of farmers and vendors. It is good the world community is now aware of this practice and that China is taking action….But executions of those found guilty now, or even prison, is just wrong, a violation of the most basic human rights, and only used to show action on the part of the Chinese government following tragic infant deaths. That is because China’s government does have much to hide. This was a kangaroo court. The Associated Press reported that a court in China gave a sentence of life in prison to the former boss of the dairy at the center of China’s contaminated milk scandal. Tian Wenhua, former board chairwoman and general manager of the Chinese dairy company Sanlu Group, will go to life in prison for her role in a tainted milk scandal that killed at least six infants and sickened nearly 300,000 others. CNN reported that three other people were sentenced to death and two others to life in prison for their roles, while three others received prison terms of five to 15 years each. Many of those sentenced were middlemen who sold melamine to milking stations that added the chemical to the milk. China’s milk scandal horrifies the public and undermines the authority of a one-party system with a hand in everything. Selling contaminated baby formula is a heinous enough crime to shock a nation, but China’s leaders know they have a dangerously destabilizing political crisis on their hands. The scandal goes to the heart of a covenant between any authoritarian regime and those who surrender freedom. They cede power with the belief, however wishful, they will be better off. Those in power promise to protect them from all manner of hazards, foreign and domestic. The unraveling of China’s milk scandal has horrified the country. Last week, the chairwoman of a diary company pleaded guilty to producing and selling fake or substandard products. Milk products contaminated with an additive that produces kidney stones has killed six babies and sickened another 300,000. Company officials knew milk products adulterated with melamine were making infants ill months before the scandal broke in September. China’s one-party system has opened the economy, but the ties between commerce and government are closely held. Any indictment by public opinion goes to the heart of the legitimacy of power in Beijing. Chinese authorities cannot maintain the illusion of control with broad failures to deliver. The killer earthquake in May near Chengdu, in Sichuan Provence, stirred outrage on two fronts. Authorities were sharply criticized for not getting emergency supplies to people. A second wave of anger came over grossly inadequate building standards, especially for schools that became death traps. The Chinese are turning to Web sites and texting to vent their frustrations and try to stay updated. China’s problems compound. The milk scandal is already complicating international trade, with the discovery of contaminated products. Foreign governments, with their own constituencies, talk aloud about their ability to rely on Chinese authorities and inspectors. The milk scandal is a grievous personal tragedy and a deep political temblor. Five parents whose children were sickened by tainted milk have been released by Chinese police after being detained for a day in an apparent move to prevent them from meeting with journalists, a lawyer said Saturday. The parents were unhappy about a compensation plan made public this week, saying the amounts were too low and the plan was formulated without any input from families. A group of about 10 parents planned to meet with journalists Friday. But five of the parents, including organizer Zhao Lianhai, were detained Thursday and held at a convention center, said Beijing attorney Xu Zhiyong. They were released Friday evening after other parents who were not detained managed to meet with a few journalists, said Xu, who is part of a legal team representing 63 families with sickened children. Zhao, who has a 3-year-old child who fell ill but has since recovered, organized other parents and created a Web site about the contamination, said Li Fangping, another lawyer for some of the parents. Zhao could not be reached for comment. Police did not give a specific reason for the detention, Xu said, but he thought it was to prevent the meeting with reporters. The Communist government, which seeks to control what the public sees and hears, frequently suppresses comments about disasters. Phones in the Beijing police information department rang unanswered Saturday, a public holiday. China’s official communist state media Xinhua has taken a turn at distorting the trial of Sanlu Dairy executive Tian Wenhua. It isn’t even clear if Tian Wenhua pleaded guilty or not guity to charges she was aware her comapany was illegally adding the poison melamine to milk and other dairy products. And it isn’t clear that adding melamine to food products was illegal in China. 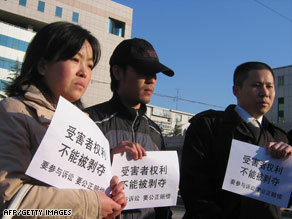 Ji Denghui made that statement in 2007 to New York Times reporters David Barboza and Alexei Barrionuevo. Barboza and Barrionuevo concluded that the use of melamine in food in China was so widespread that it was an “open secret.” In fact, our sources and our own experience tell us that the use of melamine in food in China was “normal” in China for years and perhaps decades…. All we know for sure about the current trial is this: at least six children died as a result of poisoned milk products in China and hundreds were sickened, inside China and elsewhere by exported Chinese products. China has said this evil was the result of wrongdoing on the part of food industry workers — but there is widespread evidence that the poison melamine was used in food products and other orally ingested products like toothpaste for years or decades prior to this trial…with the full knowledge of Chinese government officials. Fonterra chief executive Andrew Ferrier has taken a step back in the confusing picture of the trial of former head of the Sanlu dairy company over the contaminated milk scandal in China. State-run Xinhua news agency said yesterday that Tian Wenhua, 66-year-old former general manager of the now bankrupt Sanlu Group, pleaded guilty to charges of “producing and selling fake or substandard products”. Fonterra had a 43 per cent share in Sanlu. Mr Ferrier said last night he had heard conflicting reports from the trial of Tian’s trial, The New Zealand Herald reported. But another company spokesman later contacted the Herald to say Tian had “absolutely and unequivocally” pleaded not guilty to the charges she faced. The tainted product resulted in the deaths of six babies and illness of nearly 300,000 others earlier this year. Tian appeared with three other company executives at a court in Shijiazhuang, capital of northern Hebei province. No verdict was announced, and it was unclear whether they could face the death penalty, or life imprisonment. Fonterra had been under the impression yesterday that Tian had pleaded not guilty, Mr Ferrier said today. “However there were other reports that she had pleaded guilty. “Fonterra was not present at the trial. It is not appropriate for Fonterra to make any further comment while the Chinese court is deliberating its verdict,” he said. Media reported that Tian admitted in court testimony that she had known of problems with the company’s products for two months before she told authorities. She had submitted a written report on the melamine situation on August 2 – the same date Fonterra was told of the issue. Mr Ferrier told the Herald any suggestion that Tian knew about it earlier was “absolute news” to his company. Fonterra was also surprised by charges that Sanlu sold products after it knew they were contaminated. Mr Ferrier said August 2 was “the absolute first that anybody in Fonterra had ever heard of this and from that moment on we pushed to recall the product”. Chinese authorities had made no attempt to press charges against Fonterra, which has written off its 43 per cent shareholding in Sanlu for a loss of $210 million. The Dalai Lama, Tibet’s religious leader, pointed this out in Europe early in December 2008, but few paid much attention. China lacks the moral authority, including over the question of Tibet, to be a true superpower, the Dalai Lama said. “Because of its very poor record on human rights and religious freedom and freedom of expression and freedom of the press — too much censorship — the image of China in the field of moral authority is very, very poor,” he said. “The sensible Chinese realize China should now pay more attention in this field in order to get more respect from the rest of the world,” the Nobel peace laureate said. Ever wonder why so many schoolchildren were killed in last year’s earthquakes in China? The schools were built poorly, so poorly that they collapsed upon the first quake. Many were poorly built because of goernment corruption: the builders paid communist officials to ignore poor building practices and shoddy materials. Why does China have such a high number of deaths in mining? Because mine safety standard are very weak and regulation and inspection is worse — where they exist at all. So how does China hope to gain this superpower status? By emulating the actions of a superpower, of course. China is expanding its military and has grown to own much of the U.S. in terms of property and wealth and American debt. China proving here it is a superpower and master of Taiwan. File photo shows Chinese amphibious tanks and marines storming a beachhead in an amphibious assault drill in China’s Shandong Peninsula. (AFP/Xinhua/File) But some of those “human rights” and “moral authority” issues discussed by the Dalai Lama are foreign and indecernable to the Chinese. China’s recent poisoned milk scandal and the subsequent trial of Tian Wenhua, chairwoman of the now-bankrupt Sanlu Group, are good examples. Melamine is poisonous. Sanlu put melamine into milk. For the Chinese government, case closed. Except in China, workers put melamine into all kinds of food products for years. Melamine, which is poisonous to humans in great enough concentrations, had been routinely mixed into food products in China for years — and other similar tainted substances for decades. China is able to get away with this kind of callous disregard for truth, honesty and its own citizens because the government controls the media, the legal system, and everything else. The people only “vote” for representatives selected by the communist government which works tirelessly to stay in power by keeping order — not by obeying the kinds of basic laws and rules for human dignity most Westerners would expect — and take for granted. China Poisoned Food, Children Died; “Show Trials,” Punishment for Innocent Next? The head of China’s largest dairy firm, Sanlu Group, has argued that the country’s lack of regulations regarding a toxic chemical contributed to a tainted milk scandal that sickened nearly 300,000 infants, and killed at least six, state-run media reported. She is expected to be sentenced to life imprisonment although a verdict may not be reached for several weeks, the official Xinhua News said. Earlier reports indicated that the 66-year-old executive could face the death penalty. Her crime is that her business added melamine to milk: a practice common in China for decades. This is a show trial conducted before state media by a communist government. Sanlu put melamine into milk. Case closed. Melamine, which is poisonous to humans in great enough concentrations, had been routinely mixed into food products in China for years — and other similar tainted substances for decades. The reason this issue exploded on to the international scene was the deaths of children — not the communist government’s honesty and righteousness…. The government itself will never admit guilt because they then would be open to tens of thousands of lawsuits. That is because China’s government does have much to hide. This is a kangaroo court. Beijing’s government has little or no control over the millions of small manufacturers and farmers in the vast countryside of this rural nation of 1.3 billion people. Until this last summer’s Olympics, Beijing had never even had food sanitation and safety standards written much less enforced for restaurants — a very basic of health safety systems taken for granted in the West. Tian Wenhua, former board chairwoman and general manager of Sanlu, pleaded guilty Wednesday to her role in the scandal. She and three other executives are on trial for producing and selling fake or substandard products, according to Xinhua news agency. In a statement distributed by her attorney on Thursday, Tian said China should consider the standards of the European Union regarding the chemical melamine. She also said other independent companies under the Sanlu umbrella produced some of the “tainted milk powder” and their leaders should also shoulder some responsibility. Tian said she did not intentionally sell tainted product and had taken several steps aimed at making up for the harm caused, Xinhua reported. In her closing statement, Tian tearfully apologized. “If it meant that I could get back the health of all the sick children, I would be willing to accept any legal punishment,” she said. The three other executives on trial are former deputy general managers Wang Yuliang and Hang Zhiqi, and Wu Jusheng, a former executive heading Sanlu’s milk division. You are currently browsing the archives for the kangaroo court category.